The cordless multi-functional tool GE-HC 18 Li T Kit is a powerful device to cut branches upside and high hedges easily from the ground. 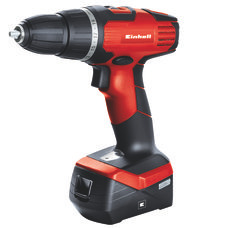 Due to its new Power X-Change battery system by Einhell, the multi-tool has a 18 V rechargeable battery with 3.0 Ah for extensive works. Thereby, the metal gearbox provides a long service life, and the OREGON quality blade and OREGON chain ensure clean cutting results. The top part is rotatable for 90° and allows effortless horizontal cuts. The claw stop prevents slipping during the sawing works. The automatic chain lubrication supplies the Oregon chain with the needed lubrication by means of an oil container. If necessary it can be tightened and changed with its practical chain tension without any tools. A chain catch bolt prevents the unwanted slipping of the chain from the blade reliably. The hedge trimmer knives made of laser-cut and diamond-ground steel ensure clean cutting results. The hedge trimmer can be transported safely and comfortably in the stable cutter guard. The GE-HC 18 Li T Kit has a battery charge level indicator with three LEDs, where you can check the current charge level at a glance. In addition, the battery pack can be used for all products of the Power X-Change family. The scope of delivery comprises an additional high-speed battery charger to reload the battery within 1 hour. The infinitely adjustable telescopic handle can exactly be set from 880 to 1840 mm to the required working height. The also infinitely adjustable, additional handgrip can be adapted to any user due to its practical quick lock. To execute even difficult cuts aloft cleanly and precisely, the motor head can be sloped 7-fold and the main grip 4-fold. Therefore, they can be adjusted to every working situation.